Formerly known as Howick Baptist Healthcare, HBH was founded by the local Baptist congregation in 1977 and retains strong links to the Baptist community and other neighbouring churches. 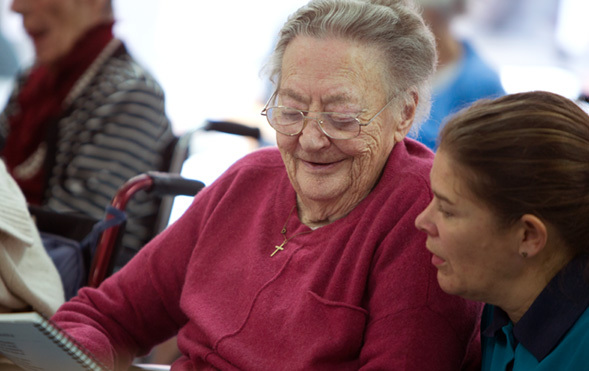 Motivated by the compassion, love and justice demonstrated in the life of Jesus Christ, our purpose is to ensure that older people have access to compassionate and responsive services of excellent quality that increase their quality of life. To this end, our on-staff Chaplain is available to provide spiritual and pastoral care for residents, family and staff. Church services are held twice weekly at our premises – on Tuesday and Thursday mornings – and special services are also held to commemorate special days such as ANZAC day. Pastors and Ministers from other churches visit regularly to take services, and congregation members assist by helping residents to attend services and volunteering for a range of activities. As well as having the requisite management and governance skills, HBH Senior Living’s Board members must be active members of a Christian church, as must our CEO. The current Board Chair, Lindsay Knowles, is a member of the Baptist church in Havelock North, and our current CEO, Bonnie Robinson, is an ordained Presbyterian Minister and is active in youth work and music in the church she attends. What’s more, the Administrative Head of the Baptist Union is also a member of the HBH Board, ensuring we stay in touch with the wider Baptist movement.